I am Posting here in this quiet corner to try to get some comments from the serious wrenchers. The 996 guys have different constraints & techniques for dropping the M96. The Boxster engine is unfortunately less accessible,more time consuming to remove but the need is often more compelling than for the 996 because of access issues. The big debate has always been drop the engine with or without the trans.- as single unit or separately. The choice can be influenced by equipment, experience or ignorance of the issues ! I am about to drop the engine for the 2nd time (!) and am determined to learn something new. Here is a proposal that needs critiquing by the experienced wrenchers among you. One of the problems with dropping the engine+trans as a complete unit is that the rear suspension cross member must be removed .This causes the rear suspension to "spread" apart.Solution - just use some very strong ratchet straps to pull it back together and get a 4 wheel alignment quickly after you reinstall the engine + trans.! 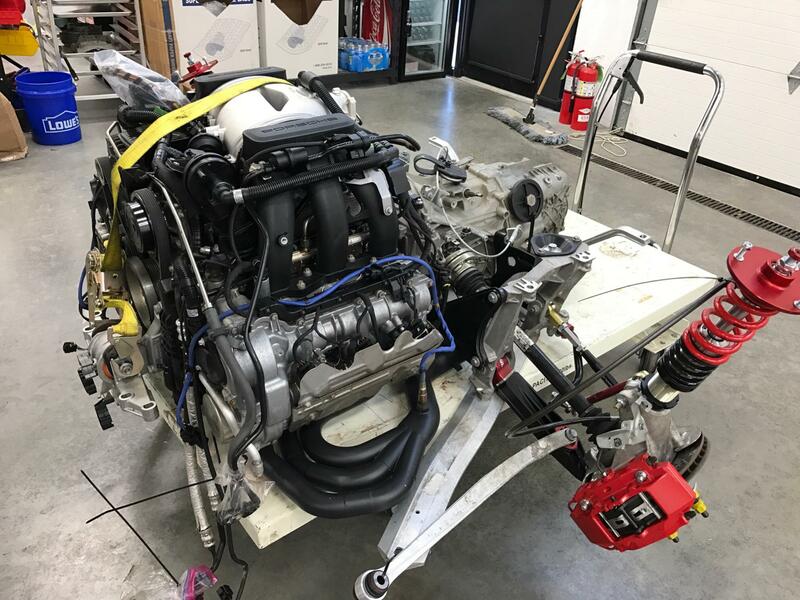 The confusion in this "How to drop a Boxster engine" discussion is because we muddle the two big but distinct parts of the complete task of dropping. The part we probably agree on is that disconnecting all the hoses.cables ,connectors and linkages is best done with a 2 post lift.The next easy part is the unbolting of the front engine mount nuts and removal of the transmission mounts. The differences come in the lowering the liberated engine+trans from the car - safely. The big question is - if the engine+trans is still 6+ feet off the ground on a 2 post lift - how are you safely lowering it ? Last time I dropped the 6 speed gearbox and then the engine separately from 6 feet+ using a massive Wudel Trans jack- It worked but it is not designed for the 36"+ length of the combined engine+trans ( unbalanced fore/aft weight).It is designed for old domestic auto transmissions. Alternative - suppose the car isn't way up high - suppose it is at Hydraulic-Cart-height - around 36 - 48 " off the ground-like the Jet 1 video.Note they used a cart that was barely long enough. You would need to crawl (literally)around underneath to remove the front engine mount and 2 trans mounts(but easy). You also need to stay there while the cart is lowered or the lift raised to deal with all the hang-ups (requires a competent,reliable helper). Example of hang-ups - the fuel flow & return lines are hooked over the E-brake cable on the firewall, the brittle oil filler tube and the dipstick tube. These are examples of the tedious details seldom mentioned but are a real nuisance if you are unaware of them.Jet busted some of these. If you decide to try the hydraulic cart+ 2 post lift method - which cart did you buy and did it work well ? Hydraulic carts that are long enough for the engine+trans and have sufficient weight capacity are around $800(see links above) - I used as a benchmark- the "Vestil CART-1000-TS". It has a table length almost 48". You'll need to make a wood cradle to prevent the engine+trans rolling sideways off the cart and to avoid crushing the headers(separate post subject). The alternative to discuss is the HF Motorcycle Lift Table .No, not the little ATVJack that the 996 guys often use, the m/c Lift TABLE It is 1000 lbs capacity,with a coupon is $299 (search hard ! )It is HF Item # 68892. It has 4 big, steel, retractable casters, is plenty long(remove the flappy ramp- just 2 pins) and use the tire vise to clamp the trans. 1. It does not lift/lower exactly vertically.It moves diagonally. But it is on casters so no problem? 2. it is HF ! so get the warranty - or spend an extra $500 on the cart linked above ? 3. The HF 68892 is only 29" high max (see crawling above !) - so make a tall cradle that avoids the need to remove the headers.! Wood is cheap. 4.Where do you store it after use? Sell it for $300 and buy another if you need to? What do you think ? Have you used this exact method? What am I missing? This Jet SLT1100 lift only goes to 36" But it is a great photo ! Last edited by Gelbster; 04-13-2017 at 08:32 AM. I removed the engine and trans as a unit from my '06 Cayman using a scissors loft and HG Hydralic table. I did need to remove the driveshafts and lower crossmember but not a problem. The question is - how high did your hydraulic table go ? I ask because some like the Harbor Freight have just one scissor and are only 3' high which requires a lot of crawling around to finally release the engine & trans mounts before you drop the engine+trans. Some double-scissor lift carts rise to 6 feet(Vestil) - which means you can do everything standing up straight. A compromise is the Roughneck XT sold by Northern Tool- at 54" . I would have purchased one but there are no Northern Tool Stores on the West coast and shipping is $172 to Los Angeles ! Last edited by Gelbster; 04-07-2017 at 02:29 PM. I think you are missing something obvious in this process; we use an old hydraulic table lift for such operations that can only rise about 48 inches from the deck. We put the car up on one of the twin post Bend Pak lifts to do the necessary fluid drains and disconnections, then lower the lift down to the table which is always left at about 3/4 full rise for small adjustments. When the lift is at a workable height, we raise the table to the engine, unloading the mounts so they can be removed, then raise the car up away from the table. Now you can either lower the table and separate the engine and gear box, or roll it out from under the car. The specific issue I am trying to improve on is the procedure after all the drainage and hose detachment has been completed at full height. If you then lower the car+engine&trans to 36" off the ground(your dimension), you need to crawl underneath to remove the front engine mount and the 2 transmission mounts.Unless you are using a type of Engine +trans support bar above? If the lift table has a double scissor mechanism ,it easily supports the engine and trans closer to full standing height. I agree, if I already had a 48" lift cart, I would do exactly what you are doing. But if I am buying new. I prefer (perhaps naively)to get closer to the ideal of standing up straight rather than the lizard position. If a lower ,inexpensive lift is O.K. ,either of the Harbor Freight alternatives would work well enough.You just have to crawl lower than your 48" lift table. This one matches my car ! Last edited by Gelbster; 04-07-2017 at 02:56 PM. Yep, this is how I did it. My scissors lift only provides 48" of height. I did cheat a little and put the car on alignment stands then added an 8" spacer extension on the lift arms. This 48" height really is not a big deal when you are disconnecting the last 4 hangers. It's more of a nuisance for all the other prep work. With the car lowered to the table, you are only removing the last few previous loosened bolts; that is all over in about one min. and the engine and gear box are free of the car. You are spending very little time at that height. Jeez, what luxury! And to think that I did all of this on jack stands and a furniture cart! Why not have the luxury of standing up straight.It is one of the few things that distinguishes me from an ape :-). This is the best solution.Buy once, buy the best ! That is after all why I have a Porsche - cough ! The Greg Smith Equipment unit is about 1/2 the price of similar OTC Power-train lifts. It weighs around 500 pounds ! It is around double the price of a Roughneck lift tables from Northern tool -which may be marginally safe and too low. I could rent it out to friends. Last edited by Gelbster; 04-12-2017 at 12:44 PM.